Medical researchers have examined the incidence of Parkinson's disease among long term smokers and have found an inverse relationship between Parkinson's disease and smoking. The Paging Dr. Gupta blog reports as follows. "The study, released today in the journal Neurology looked at the lifetime smoking history of more than 300,000 people, and confirmed the inverse relationship between smoking and Parkinson's disease, established in earlier scientific studies. But, researchers say they've found a critical new piece to the puzzle: It appears to be the length of time one has been a smoker – not the number of cigarettes smoked – that has the most effect on disease risk reduction." Medical experts hasten to assure the public that they are not advocating that people take up smoking. But they do want to know what chemicals in cigarettes reduce the risks of Parkinson's disease. Perhaps this story might wake up the public to the possible medical benefits of tobacco. Certainly, smoking a pack a day is a poor idea, but there are reputable doctors who advocate the therapeutic use of tobacco. The Access Excellence web site reports as follows on the possible medical uses of tobacco. "Nicotine in tobacco form accounts for millions of deaths each year from cancer, emphysema and heart disease. Yet, in certain neurologic and psychiatric conditions, nicotine can have useful therapeutic effects, reported scientists at the inaugural conference of the Society for Research on Nicotine and Tobacco. Nicotine is one of the most studied of all drugs. At the beginning of the century, the earliest research into neurotransmitters involved the effects of nicotine, indeed the first neurotransmitter receptor identified was the nicotine receptor. Nicotine mimics the actions of acetylcholine and has been shown to modulates many neurotransmitters." The article lists Tourette's Syndrome, Parkinson's disease and Alzheimer's disease as possible candidates for treatment with some form of tobacco derivative. 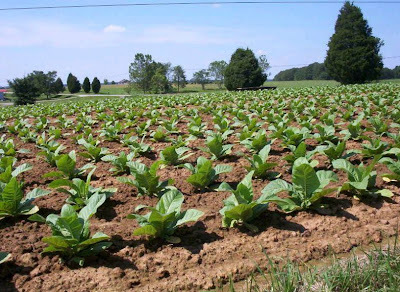 Tobacco has been in use for centuries. It is well studied. If it can be established that it has medical and industrial uses, perhaps it could be grown for purposes other than smoking. It might even be possible to work nicotine into a beverage, much as caffeine is used now. With all of the interest in herbal medicine, it is odd that tobacco has been excluded. Hopefully, the medical profession will take a second look at tobacco as a medicinal herb. We have put a lot of energy into demonising "big tobacco" and the tobacco lobby. It makes not only medical but economic sense to rebuild a tobacco industry that improves public health rather than endangers it. There is no doubt that this strategy could save and create jobs as well as improve life and longevity. It would be bitterly ironic if what we have learned about the dangers of smoking were to blind us to the possible life saving qualities of tobacco. Science should not be a slave to the fads of the age. George Washington Carver discovered hundreds of uses for peanuts, as food and in industry. The time seems ripe for tobacco to have its own George Washington Carver. Tobacco clearly has many uses. For the good of humanity, it is about time that we discover them.